Graduate Teaching Assistants (GTAs) play a large role in the undergraduate teaching experience, with responsibilities varying from grading assignments and taking attendance to holding office hours, designing and presenting lectures, and writing exams. Given the many obligations that both professors and GTAs must fulfill, positive interactions between them can help all class members have a successful experience. Poor interactions, on the other hand, can negatively impact the effectiveness of the teaching team and the resulting teaching product. Therefore, concerted efforts should be made to ensure that these interactions are positive experiences for everyone involved. Calculate the total GTA hours you have for the term. Identify the range of tasks the GTA is capable of doing. Rank the order of those functions as activites that enhance understanding. Make teaching a team project. Before the semester starts, meet with GTAs and review the course structure and goals. Review the course organization and syllabus, or consider writing the syllabus together. Sharing with GTAs reasons why you made decisions during course planning will expose them to the course development process, as well as make it easier for them to address student questions. During the semester, involve GTAs in class on a daily basis. Require them to attend lecture; this will make them visible and accessible to students, provide you assistance with logistics, and keep them abreast of material you’re teaching. To further involve GTAs, ask for their input on your lectures, have them give a lecture of their own, and write/grade exams as a team. Ask your GTA to be an information source about student learning. 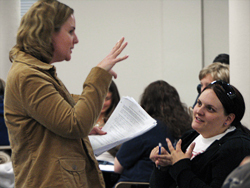 Provide GTAs with a grading rubric to ensure quality and consistency of assessment. Meet with GTAs weekly to discuss challenges they have encountered; have them summarize questions they are getting from students that reflect levels of student understanding of course material. Or, ask the GTA to provide you with representative lab write-ups, essays or assignments from their class; this way, you can record benefits and pitfalls of assignments and gauge student progress. Provide feedback on their work. While GTAs should have autonomy in their classes, most still require guidance and support. Offer to observe classes (as support, not as a check-up), then meet to acknowledge their accomplishments and offer teaching advice. GTAs perform best when they’re well-prepared; during the semester, meet weekly to discuss issues from previous classes and help them prepare for future lessons. To maximize their professional development, meet with GTAs individually after the end of the semester to provide feedback on their performance. Finally, direct GTAs to resources outside the department that may help them enhance their teaching. Lewis, K.G. (Ed.) (1993). The TA experience: Preparing for multiple roles. Stillwater, OK: New Forums. Perlmutter, David M. (2008). Supervising your graduate assistants. The Chronicle of Higher Education. (Online).